A city in China may soon have a second moon in its evening sky. Moonlit skies over the Chinese city of Chengdu may soon get a boost from a second moon. City officials recently announced plans to build an artificial moon, launching it to hang over Sichuan province's capital city by 2020, Chinese news site People's Daily Online (PDO) reported. In fact, light from the artificial moon is expected to save the city money by doing away with the need for streetlights, Chunfeng added. The new moon will be capable of illuminating an area of up to 50 miles (80 kilometers) in diameter, according to PDO. Though the human-made moon will light up only Chengdu, the glowing ball will be visible across China and even overseas, Asia Times reported. The real moon, of course, can usually be seen from anywhere on Earth. But little is known about the height, size and true brightness of the proposed artificial moon — all of which are factors that could affect its visibility to distant observers. It is also unknown if the project has secured official support from the city of Chengdu or the federal government, The Guardian reported. This isn't the first time that a country has tried to outshine the moon. A similar project was unveiled by Russia in the 1990s, with the launch of a solar reflecting system — a "space mirror" — intended to produce light "equivalent to three to five full moons" covering an area approximately 3 miles (5 kilometers) in diameter, the New York Times reported in 1993. Another Russian attempt to launch a space mirror in 1999 fizzled before it got off the ground, according to The Guardian. 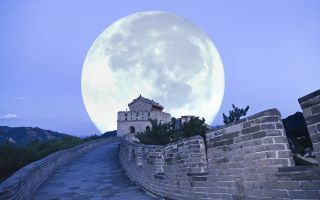 Regarding concerns about the Chinese artificial moon interfering with astronomical observations or disrupting animals that are active at night, Kang Weimin, the director of the Institute of Optics of the Harbin Institute of Technology in China, said that the light would amount to only a "dusk-like glow," PDO reported. However, research has shown that many animals are highly sensitive to the light and phases of the moon. For example, nocturnal eagle owls communicate with each other through the display of white throat feathers, and scientists have found this activity increases during the full moon, when moonlight is brightest. And in Australia's Great Barrier Reef, hundreds of coral species simultaneously release their eggs and sperm in an annual mass spawning event linked to the level of moonlight. The size and illumination technology of Chengdu's artificial moon are not yet available, so it remains unclear if the brightness of the proposed artificial satellite would indeed be intense enough to interfere with the routines of local wildlife. In addition, while the company is calling it a "satellite," which suggests that it will be launched into geostationary orbit — in which the orb circles the Earth above the equator — no details have been released about how the company plans to deploy the "artificial moon."